In September 2017, Australian Education Minister, Simon Birmingham, announced the intention to roll out a phonics check in Australia. QLD and WA dug their heels in and said ‘not on our watch’, whereas SA and NSW were applauding the announcement. It will come as no surprise to you that here, at Phonics Hero, we wholeheartedly agree with the implementation of a phonics check! Collectively we have worked in Synthetic Phonics for over 30 years: publishing books, developing online games and working with schools implementing the systematic teaching of phonics. In 2013 we watched the roll out of the Phonics Screening Check in England, the backlash from the whole language advocates and, most importantly, the subsequent year-on-year improvements that resulted from the intervention that addressed the ability of students to decode in both familiar and unfamiliar words. What Will the Phonics Check Look Like? At the moment, it’s looking like Australia is going to replicate the England’s Phonics Screening Check. The Phonics Screening Check is a “light touch assessment” to inform schools, teachers and parents how much of the phonics code a child knows and can use. Children are asked to read 20 real and 20 nonsense words which become increasingly difficult as the check progresses. It incorporates nonsense words as these are the best way to check that a child has the necessary underlying phonics skills and isn’t just recalling the ‘look of the word’. It will accurately pinpoint the sounds a child does and doesn’t know. The check will be done by a teacher the child knows and doesn’t have a time limit. If the child struggles the check can be stopped early. In past years the pass mark has been 32 out of 40 words correct. Is it Unnecessarily Stressful for a Child? It shouldn’t be any more stressful than the Running Records or summative assessments many of you will already be doing in your classroom. 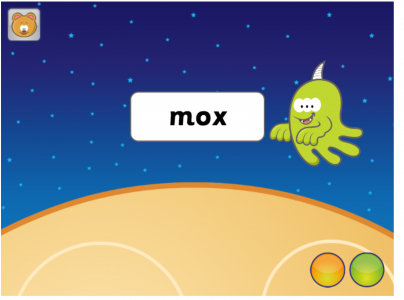 The nonsense words will have an alien or monster next to the word, as in this image below, taken from the current UK Phonics Screening Check. Teachers should make it a fun and light experience. In fact, children often love reading these unusual words! You could get children to name the aliens or invent a story of an alien coming to land and teaching the children their language! We made a Phonics Screening Check game, have a go with your students here and see how much fun it can be! Click the image below to launch the game. It is proposed that it will be taken in Term 3 of Year 1 and re-administered in Term 4 of Year 1 for those who did not pass. In the England the test is redone in Year 2 for those who did not meet the benchmark the first time round. It’s not yet clear if this would also be the case in Australia. Why Phonics and Not Just Check Their Reading? Phonics is an early, but critical, skill in learning to read; it allows a child to ‘lift’ a word off the page. Then comes comprehension. If he/she can’t lift the word off the page, how can we expect a child to comprehend what it says? As Psychologist and Speech Pathologist, Professor Pamela Snow, said, knowledge of phonics “is necessary but not sufficient for beginning readers”. Think about learning a musical instrument: you don’t play like Beethoven just by learning to recognise the notes, but it is the first necessary foundational step to launch you as a musician. Federal Education Minister, Simon Birmingham, understands how expensive and difficult it is to catch children up in Year 3 and further on. Researcher, Keith Stanovich, talks about the reading “Matthew Effect”, likening it to the term from the Bible where the rich get richer and the poor get poorer. 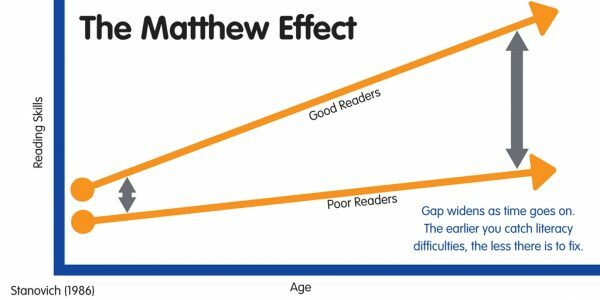 In reading, the gap between the good readers and the poor readers gets bigger and bigger. The chart below demonstrates this perfectly. By checking whether or not children have mastered the phonics code, teachers will be able to intervene early and give the critical support that can make all the difference to reading progress. The aim of the phonics check is to pick up those who are struggling to decode early, to fix the problem before the gap between the bottom and top students gets too big. Minister Birmingham intends to push for the phonics check to be rolled out in 2019, but of course, he first has to persuade the states. Right now the phonics check materials are being developed, with a pilot being run in South Australia. It’s simple; teach all 44 sounds of the English language and how to blend the sounds together to read a word! If the child has these two skills he/she can tackle any word, be it “shrep” from the check or “hinkypunk” from Harry Potter! Synthetic Phonics has been proven time and time again to get results – it’s the most effective phonics method. For those new to Synthetic Phonics grab yourself a free Phonics Hero Teacher Account and start tomorrow! There is no better time than the present! And, to those who are already teaching Synthetic Phonics, you will already be getting the results and relishing the opportunity to show off just how well your students have done! Your moment of glory is coming! After lots of discussion, it ended with only South Australia persuaded to trial the Phonics Check. The results were disappointing, with only 15% achieving the threshold of 32/40. There is a long way to go: 81% of children in England meet this threshold. However, what is exciting, is that this result has given teachers in SA a clear roadmap of what needs to be taught. The SA government has now announced all Year One students will go through the Phonics Check in Term 3 of next year. We’re confident, with systematic teaching of synthetic phonics, we should see a lift in the results for 2019! Exciting times for the improvement of reading in SA!